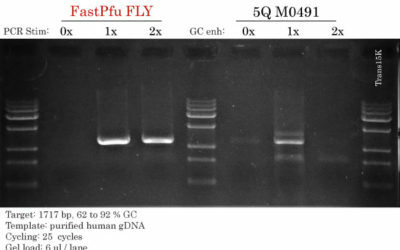 Our aim was to verify compare FastPfu FLY (TransBionovo) and Q5 (NEB) high-fidelity DNA Polymerase at amplifying a GC-rich sequence (human ARX; 79% GC) from purified human genomic DNA. GC-rich PCR often requires the addition of different molecules to PCR reactions to act as DNA ‘looseners’. FastPFu FLY uses a compound named PCR Stimulant. Q5® (M0491 from NEB) uses a GC enhancer. According to our sense of smell (yes we smelled them), both are different in composition. Q5 is a registered trademark of New England Biolabs, Inc.
Aristaless-Related Homeobox) exon 2 containing 2 polyalanine tracts. Alanine tracts are coded by imperfect trinucleotide repeats (GCN), among which GCG is significantly over-represented in the polyalanine coding sequence (5). It is stable during both meiosis and mitosis (6). However, polymorphisms in length are frequent involving more than 30% of tracts longer than seven alanines and correlating with the length of both the overall tract and the number of a single codon in a row (5). More details can be found here. We’ve previously described the successful amplification of ARX from pure and unpurified gDNA using FastPfu and FastPfu FLY. These previous results served as guidelines for the present annealing temperatures (Ta) used herein, concentrations of PCR stimulant and primer concentration. 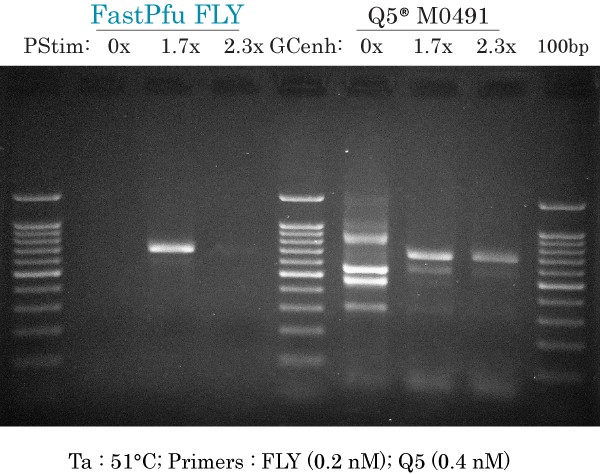 In an attempt to compare FastPfu FLY to Q5® High-Fidelity DNA Polymerase (M0491 from NEB), we varied the final concentrations (0x, 1.7x or 2.3x) of PCR Stimulant (for FastPfu FLY) or GC enhancer (for Q5), and primer concentrations used with both enzymes. Primer concentrations used with Q5 were kept constant at 0.4 nM close to the recommendations of the manufacturer, which are of 0.5 nM for each primer. PCR Stimulant or GC enhancer: 0, 5 or 7 ul (0x, 1.27x or 2.3x final) of each matching their polymerase. Reactions were set up on ice because the Q5 version M0491 is not a hotstart DNA polymerase. Poly-alanine tracts, GC(N) repeats are indicated in bold and red color. 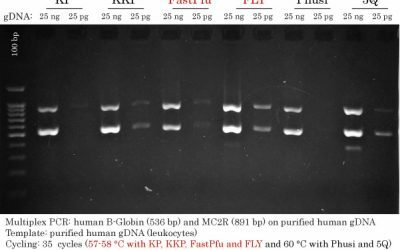 PCR amplification of human ARX 658 bp at Ta 53°C using low primers (0.2 nM each) for FastPfu FLY and high primers (0.4 nM each) for Q5 using a gradient of PCR Stimulant (PStim) of GC enhancer (GCenh) for each DNA polymerase. 0x : at least 5 non-specific bands and no specific band at 658 bp. 2.3x : 1 non-specific band plus specific band at 658 bp. 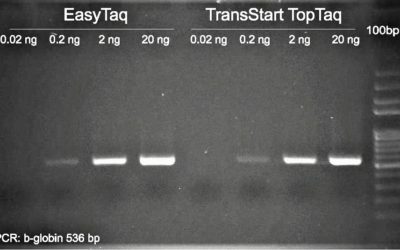 PCR amplification of human ARX 658 bp at Ta 53°C using high primers (0.4 nM each) for both FastPfu FLY and Q5 using a gradient of PCR Stimulant (PStim) of GC enhancer (GCenh) for each DNA polymerase. 1.7x : intense and specific band, with ‘ghost-like’ very faint non-specific band at approximately 600 bp (very similar to 0.2 nM condition). Some very faint smear can be seen in the range of 200-400 bp. 2.3x : Very intense specific band. Very faint non-specific band at approximately 600 bp (very similar to Q5). Some very faint smear can be seen in the range of 200-400 bp. 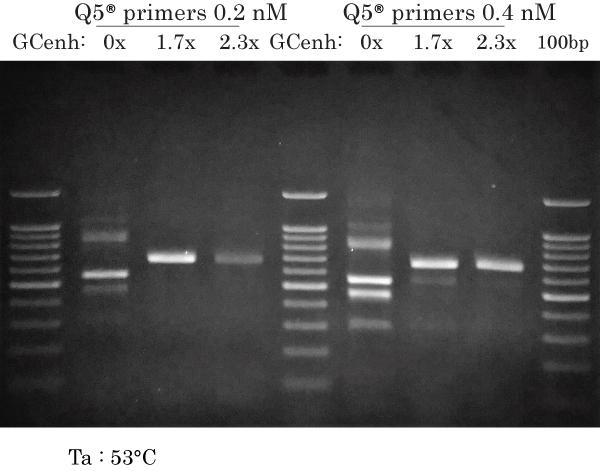 PCR amplification of human ARX 658 bp at Ta 53°C using low (0.2 nM) or high primers (0.4 nM each) for Q5 using a gradient of GC enhancer (GCenh). 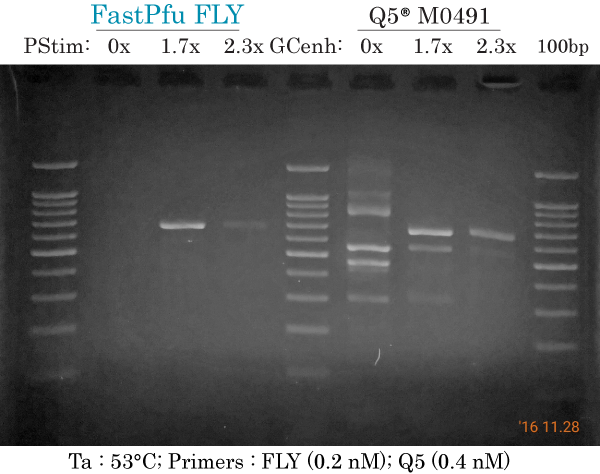 Overall, very similar pattern to FastPfu FLY with Ta 53°C and 0.2 nM primers, at the exception of the 5 non-specific bands present without GC enhancer obtained with Q5. 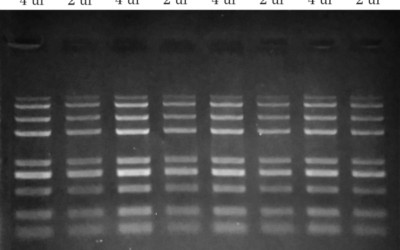 Different PCR reaction than previous data, but same results as previous data because of same conditions (at Ta 53°C). The manufacturer recommends using 0.5 nM of each primer. Our results indicate that the product recommendation for Q5 M0491 should be omitted in the present example nad using 0.2 nM of each primer is optimal under our experimental conditions. 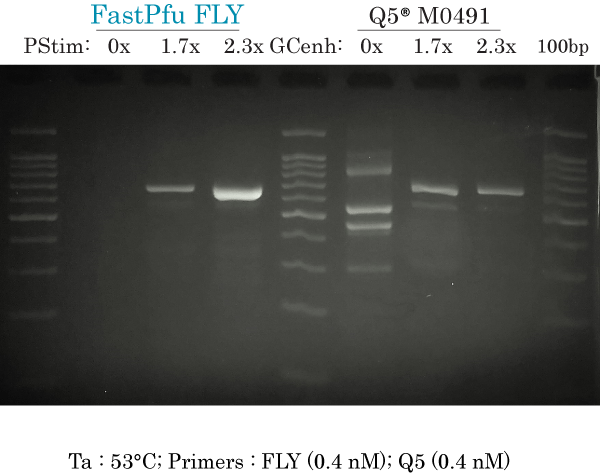 PCR amplification of human ARX 658 bp at Ta 51°C using low primers (0.2 nM each) for FastPfu FLY and high primers (0.4 nM each) for Q5 using a gradient of PCR Stimulant (PStim) of GC enhancer (GCenh) for each DNA polymerase. 2.3x : 1 or 2 non-specific bands plus specific band at 658 bp. Small amount of smearing above the 658 bp band. 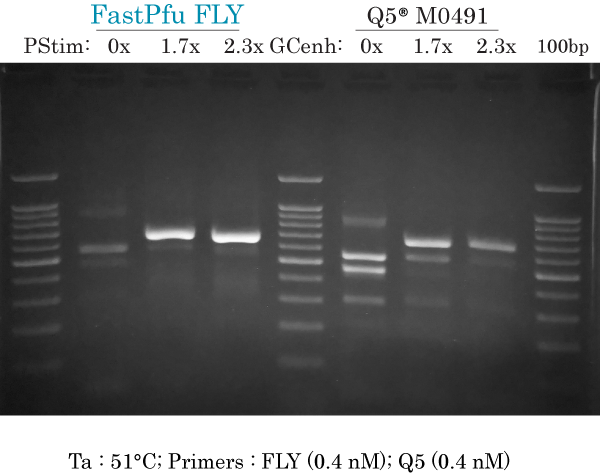 PCR amplification of human ARX 658 bp at Ta 51°C using high primers (0.4 nM each) for both FastPfu FLY and Q5 using a gradient of PCR Stimulant (PStim) of GC enhancer (GCenh) for each DNA polymerase.). Despite resulting in highly intense specific bands using 1.7x or 2.3x PCR Stimulant, these PCR conditions were not ideal for FastPfu FLY because the 0x PCR Stimulant condition started to show the same pattern of non-specific bands as obtained with Q5, but with much lesser intensity. Our conclusion is that we were able to amplify human ARX exon 2 from purified human gDNA using either FastPfu FLY and Q5 DNA polymerases, with the help of PCR Stimulant or GC enhancer. FastPfu FLY was easier to work with because we could follow the manufacturer’s recommendations, whereas we had to tune things up for Q5 from NEB. FastPfu FLY overall produced much less non-specific amplication than its counterpart. Most amplicons were pure and specific with near-neglectable (difficult to see) and occasional non-specific bands, at the exception of the low annealing temperature and high primer concentration condition. Which polymerase will you choose for your next GC-rich PCR? 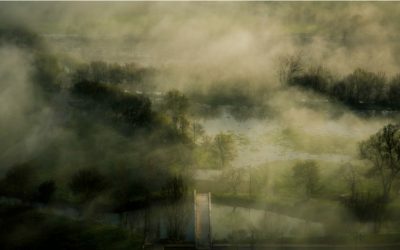 Specifications and pricing of commercially available Taq DNA Polymerases and High-Fidelity DNA Polymerases in Canada. 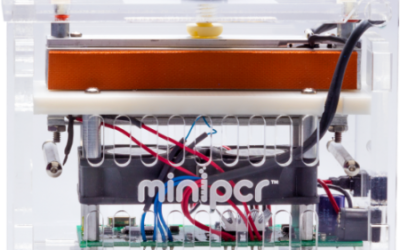 miniPCR Review : How I use a portable PCR thermocycler to help life scientists day-to-day.